The final book in this series is as sweet and redemptive as the ones before. As usual, past hurts and difficulties are overcome by the support of the loosely connected and tightly knit family the characters in this series have created for themselves. Despite some initial angst, this is the happiness and sunshine side of Amy Lane – a healthy dose of comforting romance. The fourth book follows a very similar formula to the earlier ones. Robbie is seen by Darrin before he arrives in time to rescue Finn. He arrives with baggage, but like each of the new characters in each of the other stories in this series, Robbie is embraced by the Candy Man family as he comes to terms with the past and makes a new future for himself. Family dramas aren’t quite as intense as they’ve been in earlier books, but it feels like we’ve seen Robbie’s homophobic parents before. Add Robbie’s search for romance and his need to find an adult purpose in life, and it starts to feel like a slightly formulaic repeat of various elements of the earlier books in the series. Cy is wonderfully unique. We’ve seen glimpses of the beautiful dancer before, but this is finally his story and he makes a fantastically reluctant leading man. As always in an Amy Lane book, the connection between Cy and Robbie is emotional, tender, and sweet. This feels like the last in this series and the recycled elements here suggest it might be time to put it to bed. But I loved catching up with the enormous cast of characters and the happy couples from previous books. I love the series – it is a romantic and hopeful and gloriously sentimental injection of sugary happiness. 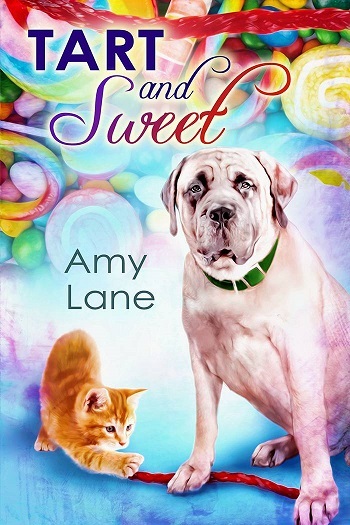 Reviewers on the Wicked Reads Review Team were provided a free copy of Tart and Sweet (Candy Man #4) by Amy Lane to read and review.